You know yourself, your skills, your interests, and your passions… but getting this across to recruiters during the job search process can be difficult, especially when you’re told you only have one page to list your experience and get your personality across. To guide you in taking the first steps forwards building your best resume to date, we’ve put together some best practices that we’ve found students and job seekers found most helpful when reaching out for professional guidance or resume review. 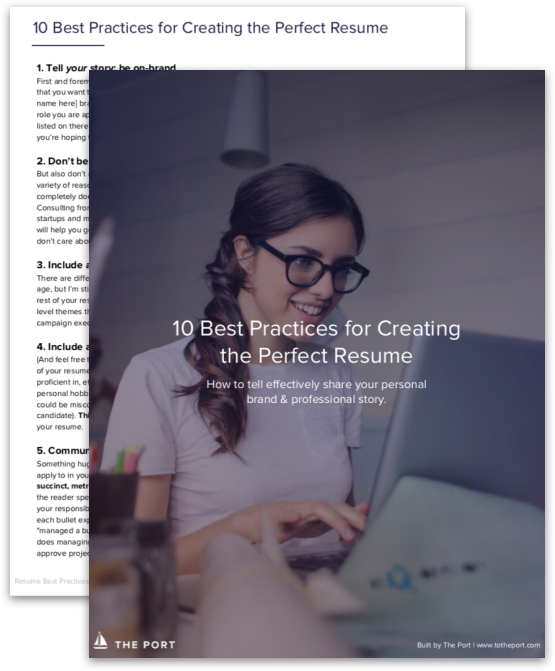 Download the 10 Resume Best Practices today to craft the perfect personal brand story that will help you find the job of your dreams. Interested in more personal branding resources and guidance? Send us a note at sail@totheport.com. Thanks for visiting The Port! To download your resource, click here or visit http://bit.ly/port-resume-best-practices.